A deity of widespread faith and influence, Gwal Devta also known as Goril or Goll, is considered to be the presiding deity of justice. It is believed that when approached, Gwal Devta dispenses justice to a helpless victim of injustice and cruelty. Historically, Goril a Katyuric prince of Champawat, known for his unwavering justice and fair play, was himself a victim of planned conspiracy hatched up by his step mother, who had thrown him into a river, locked up in an iron cage. Held in high esteem as a symbol of justice, a temple was dedicated to him at Gwarail Chaur at in Champawat and ever since he has grown into a deity of great influence attracting innumerable pilgrims around him. As per a story, Harish Chandra was a famous king of Champawat, who after his death, was worshipped as the folk god ‘Haru’. Haru’s mother’s name was Kainer and he is said to be Gwall’s maternal uncle. The nearest airport to Champawat is Pantnagar Airport situated 160kms away in the Nainital district of Uttarakhand state. Taxis are available from Pantnagar Airport to Champawat. Pantnagar is connected to Delhi with four round flight in a week. 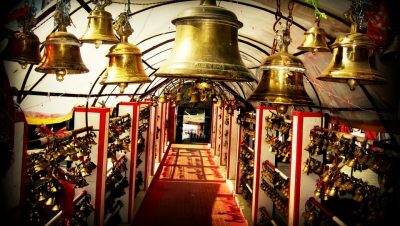 Gwal Deveta Temple is situated at a distance of 2 kms from Champawat. Taxis and buses are easily available from Tanakpur Railway Station to Champawat . Champawat is well connected with major destinations of India like Lucknow, Delhi, Agra and Kolkata. Trains are frequent to Tanakpur Railway Station and Champawat is well connected by motorable roads with Tanakpur. Champawat having facility of accommodation in hotels,dharamshalas and guest houses.